The gas coupon is on again! Happy dance, our gas is 141.9!!!! I did almost all my shopping at Superstore today. My cashier was amazing! She took coupons, price matched(even produce) and let me separate orders for my Checkout 51 accounts! Then, she went above and beyond and saved me a lot of hassle!!! So, nice to have happy shopping stories! 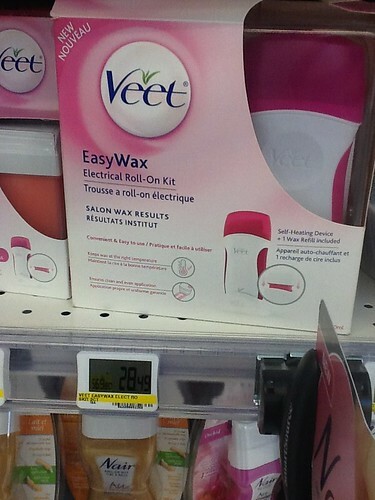 Below is a picture taken of Superstore's price for this Veet system. The company is offering $15 MIR and there is a $10 coupon on smartsource . I noticed that Shoppers has this system on the front page of their flyer for next week. They are 20% off and you get 5X the points. Might be something to use this weekend with the surprise points offer??? This weekend only Armstrong Cheese 700g $6.99 limit 2(there are $1 coupons from a magazine and .75 coupons on the SmartSource site. Reactine 3s $3.29(Checkout 51 is offering $3 cash back)there are coupons to print also here . This is a money maker.